Acoustic guitar and vox lovingly crafted by Tyler Massey. There's a 60's vibe here at times, Tyler's voice reminds me of Lennon, particularly on 'Dollar Bill' where there's a definite Beatles feel to the vocals. Listen to the track once and it'll be stuck in your head all day or better still iPod it, some stuff is just built for headphones. The album opens with a short pretty burst of guitar as it's title track before 'Clarity's' gentle strumming and soft lament welcomes you properly to 'The Ocean Within'. Beautifully understated with a genuine feel to the vocals that's a rare treat these day. 'Sirens' has a brittle, breakable feel to it that suit Tyler's voice, it reminds me of Placebo's less abrasive music, the kind of song that grows on you after repeated listens. Although 'Dirty Little Secret Love' sounds like it's going to be similar to the previous two songs in tone the chorus is to die for. Tyler's voice grasping for the high notes. Emotive and clearly sung from the heart. Stand out for me though, 'Dollar Bill' sits mid album and is followed by 'Only Me' another lovely uplifting song that you can imagine singing along to in an old English pub on a Sunday afternoon over an ale. The album closes out with 'Supergirl' and the stunning 'Anthem' (a close second for song of the album) before finishing with Tyler's eldest, at three years old, free-styling her way through 'Left or Right'. You get the feeling Tyler had the recording of her and him kicking around for years but needed some where to find a home for it. Well he found the perfect place here, The Ocean Within is a great album. Forget that this might not be by someone you've heard of, or that it was recorded on a micro budget, because you will 'forget' that when you've listened to the songs here. 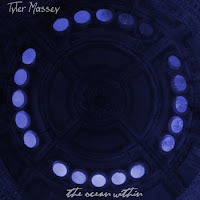 Beguiling stuff from Tyler Massey, The Ocean Within is available from Band Camp for a minimum of £5. Here's 'Dollar Bill'. Have a listen then go buy the album.